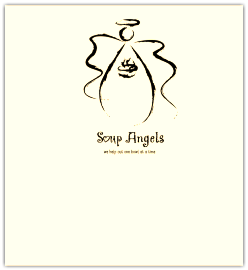 Soup Angels will soon enter its 6th year of offering healthy, home-cooked (at the church!) meals to anyone who needs a meal, no questions asked, in our Nyack area. We serve Wednesday evenings from 5:30-6:30pm and have been serving 120 portions of food at each meal. As the strains of our current economy take their toll on working families, the elderly, teens, veterans, the disabled and recent immigrants in our Nyack community, Soup Angels has decided to offer a second meal on Monday nights from 5:30-6:30pm starting in January. Soup Angels welcomes additional volunteers for the 8 new teams who will serve a healthy, hearty sandwich and salad each week to anyone who needs a meal in our community, no questions asked. In November 2011 Soup Angels sent 1800 meals out to agencies around Rockland County such as Headstart, the Martin Luther King Center in Spring Valley, Nyack Senior Center, Rockland ARC, and many others as well as offering 200 sit down turkey dinners in the Pitkin room at First Reformed Church. To volunteer or find out more about Soup Angels, email us at soupangels@gmail.com or find us on the web at www.soupangels.com. For further information, contact or speak to Katherine Rife. You can also make a donation online now.